I recently was turned on to Orchard Farm by the lovely Umber Dove. I just received my package yesterday, and oh was it awesome! 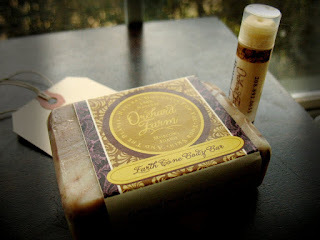 I bought the Earth Tone Body Bar and the scent is absolutely delicious (I've yet to use it, but will do so soon). They also sent me a peppermint lip balm! How did they know peppermint is one of my favorite oils???? The scent alone is sublime and the way it makes my lips tingle causes a definite case of effervescent bliss. What an awesome shop, and very lovely people! 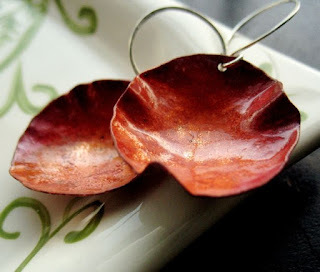 In my shop today are the new Garden Path earrings. Heat treated and lovingly formed into the abstract silhouette of a flower. Imagine wildflower fields. I love them tremendously and am looking forward to the day when the weather turns with the season and lying in one won't bring about frost bitten appendages. I hope you're having a wonderful week! We're supposed to have a snow and ice storm tomorrow!!!! Thanks for the recommendation, and the new earrings are quite beautiful! Have a great one! I love colour of these! Perfect. The packaging is beautiful on your treats. I love peppermint too, 4 drops lavender and 6 of peppermint into the "relaxation" bath.